With many Wisconsinites struggling financially, State Representative Mark Pocan (D-Madison) says Assembly Democrats want to make sure government is doing everything it can to help them get by. Pocan says there&apos;s a crisis in confidence in the nation&apos;s economic future, and Democrats are ready to address those problems. Democrats rolled out a plan Thursday that includes investing in Green jobs, offering incentives to keep employers in the state, and creating protections for consumers. Pocan says there needs to be a change in direction in the Assembly, to make sure families are a top priority. 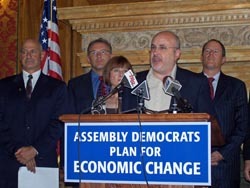 Democrats are seeking to retake the Assembly majority during the November elections. Pocan says Republicans blocked many of the proposed reforms during the last session. They hope to re-introduce them during the next session, which could see them in control of the Chamber. Republican leaders fired back at the plan, saying it would only result in more government spending and higher taxes on job creators.